Did you know - Ozb&b.com now has over 600 members! We represent accommodation from over 300 Australian towns and cities. "You don't need to be a rocket scientist to work out what this site is all about. What sets it apart is the sheer volume of information available. This alone makes it very usable when looking for a holiday spot." Welcome to the fifth edition of OZ-Traveller! We hope you had a great Australian Day long weekend. Lots of "Bums in the Beds" as one of our members suggested. Activity on the site was fantastic over the holiday weekend with OZbedandbreakfast.com reaching record breaking numbers for the four consecutive days. Much of this traffic was generated from an article in the Sydney Morning Herald's Icon section. You can check out the feature yourself at http://www.smh.com.au/icon/0201/26/sites4.html. As you know, we are trying to build our name and our logo. We hope you start seeing the benefits of the increase in regular users as our name becomes more recognisable to the general public. One of the ways of building public recognition is achieved by getting visitors to return to the site. One way in which we do this is our getaway competition. 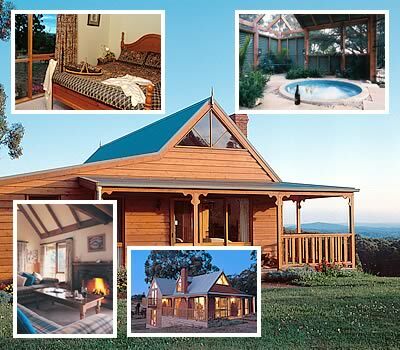 We have had a fantastic response thus far to our Araluen Lodge summer getaway competition. Over 300 entries have been submitted. The competition closing date is fast approaching (Feb 15), and we will announce the winner in our next newsletter and on our hompage. We truly hope you are starting to enjoy the benefits of our website. Good things come to those who wait. We have been working hard here at OZbedandbreakfast.com, and the waiting is just about over! What can we say? What a fantastic launch this new section has been. We received over 100 submissions for our new HOT $$$ DEALS section. We want to thank each and every one of you who sent in a submission. Unfortunately, we could not accommodate all of the submissions and had to pick and choose. If your submission didn't make it this time around, don't worry. We will be providing you with another opportunity to submit your details in the near future. What do we look for in a submission? We look for a submission that clearly shows the deal being offered to the guest. We like to see a catchy subheading that can be used to catch a reader's eye, and a small (less than 100 characters) description of what it is you are offering. It must be a DEAL! It cannot be an ongoing promotion that you run all year long. By writing your submission with the above ideas in mind, you have a very good chance of making our next list of HOT $$$ DEALS. Visit our homepage to view all our hot deals. As you are aware, your profile page contains a link to Expedia.com Travel. We use Expedia to display a map with the location of your town as maintained on your profile. The map can be used to zoom in and out of the area. For this service to work effectively, your profile MUST contain a valid Australian town or city. For example, a map will display correctly for "Nowra" or "Brisbane" or "Gembrook". However, an error will be returned if you have maintained you town or city incorrectly such as "Gosford via Sydney" or "Apollo/Wongarra". The town or city must be a valid Australian name. We have included another field on your profile that is not shown to users, but is used in searches. Under your Address Details in BBProfiler is a field entitled "List City". This can be used to nominate the nearest major (within 20KM) city or town. Again, it must be a valid city or town. The search capabilities will be linked to this new field in the next couple of weeks. Therefore, if you are in Penrith, NSW, you can nominate Sydney as your List City and be show in searches for both "Penrith" and "Sydney". More exposure, just by using the List City field. Click here to update your profile now. Please, only enter towns or cities that are within 20KM of your property. Is the purchase of a bed and breakfast business a good investment? The answer is, "Yes," according to long-time industry appraiser Michael Yovino-Young, a Berkeley, CA-based expert who has been tracking bed and breakfast sales for more than a decade in the US. During a period when other lodging properties lost as much as 50 percent of their value, from 1990 to 1998, bed and breakfasts held steady and even prospered, according to Yovino-Young, who presented current trend data to aspiring innkeepers attending a workshop presented by the California Association of Bed and Breakfast Innkeepers, held in San Diego in January. Yovino-Young tracked the three indexes typically used to appraise bed and breakfasts for 103 properties which changed hands between 1994 and 2000. They include Price Per Room, which is the total sales price divided by the number of legal rooms. The Gross Income Multiplier is the sales price divided by the gross annual income; this typically ranges between 3.5 and 5 with the lower number being more desirable. The Capitalization Rate or overall rate of return on investment is calculated by dividing the net operating income by the price; it typically ranges between 9 and 14 percent. Taken together the three indexes provide a snapshot of the viability and potential of bed and breakfast property. According to Yovino-Young, during the tracking period the price per room generally increased, while the gross income multiplier and capitalization rate held steady...even during a bleak period for the lodging industry as a whole. This information shows that bed and breakfast outperforms the lodging industry as a whole; it can make an effective argument with a lender who seems convinced that investing in a bed and breakfast is risky. It's good information to have, even if it is based on a US study! To find out more about B&B's FOR SALE, click here. We are continually listening to your requests and comments. Please continue to send us ideas. This website is for you! We want to hear from you. In fact, a new feature launching this month titled "Your Turf" will focus on your tourist region and its surrounds which will include a listing of relevant accommodation in your area. This is a fantastic opportunity for you to show off your area, local attractions and of course your accommodation. The more effort put into the submission (photos are good), the more likely we are to publish the article. Yes, this is all FREE! So, send in your submissions to info@ozbedandbreakfast.com.